Pat, Val, Paul, Anne and I headed straight for Paphos Headland where a walk along the coast line produced four Greater Sand Plover, a Eurasian Golden Plover, a Whimbrel, a Ruddy Turnstone and two Common Sandpiper. Two Common Kingfisher squabbling over territory was great to see and we also found a Tawny Pipit in the scrub as well as a Zitting Cisticola and several Spanish Sparrow sitting in a couple of bushes. Two Northern Lapwing flew over – an unusual location for them. Our next stop was the Ezousas Valley near Agia Varvara where we found many Willow Warblers, a Eurasian Sparrowhawk, two newly arrived Common Stonechat, a couple of Chukar and a distant Cyprus Wheatear. A couple of the Soakaways still held water but the only birds we found on them were a couple of Common Moorhen and a young Grey Heron. At Paphos Sewage Works we quickly found at least six Spur-winged Lapwing but it took us a bit longer to find and get decent views of the three Red-throated Pipit that we could hear feeding in the fields with the many White and several Yellow Wagtail. A juvenile Red-footed Falcon was migrating overhead as we left. The three Red-throated Pipit in the fields near the sea at Mandria were more obliging and we had great views of them – still mainly in breeding plumage. We found three Northern Wheatear, a Tawny Pipit and a Whinchat, and then watched a Long-legged Buzzard fly over and perch on the top of a tall conifer while being mobbed by Hooded Crows. Two Eurasian Sparrowhawk were flying over as were four Northern Lapwing. 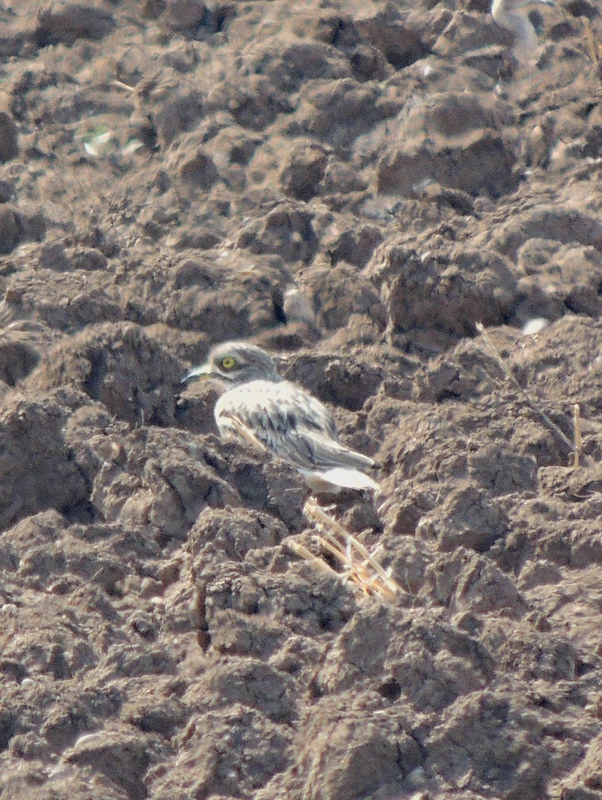 We were especially pleased to spend some time watching at least 35 Eurasian Stone Curlew on a ploughed field. We then went to Petra tou Romiou and were treated to a flying display by four or five Eleonora’s Falcon. Another Eleonora’s Falcon gave us a surprise at Kouklia Soakaways when it flew up from the water in the river bed there. A Long-legged Buzzard was also flying in the valley and we saw another of those on the approach road to the Asprokremmos Dam being pursued by a flock of Hooded Crow. Both darker birds than we had seen at Mandria. A male and female Cyprus Warbler played hide and seek behind the Dam but finally the female at least allowed us to see her well, the male giving only the briefest glimpses. Our last stop was at Minthis Hills where we were hoping to get better views of the Cyprus Wheatear. We were very pleased to find one as soon as we turned into the area and then another a bit further along the track. Our final species were two Bonelli’s Eagle that gave us a great fly by and a fitting end to the day. Categories: Cyprus Birding Tours Trip Reports | Tags: Asprokremmos Dam, Bonelli's Eagle, Cyprus Birding, Cyprus birds, Cyprus birdwatching, cyprus trip reports, Cyprus Warbler, Cyprus Wheatear, Eleonora's Falcon, Greater Sand Plover, Long-legged Buzzard, Paphos birding, Red-footed Falcon, Red-throated Pipit, Spur-winged Lapwing, Zitting Cisticola | Permalink. 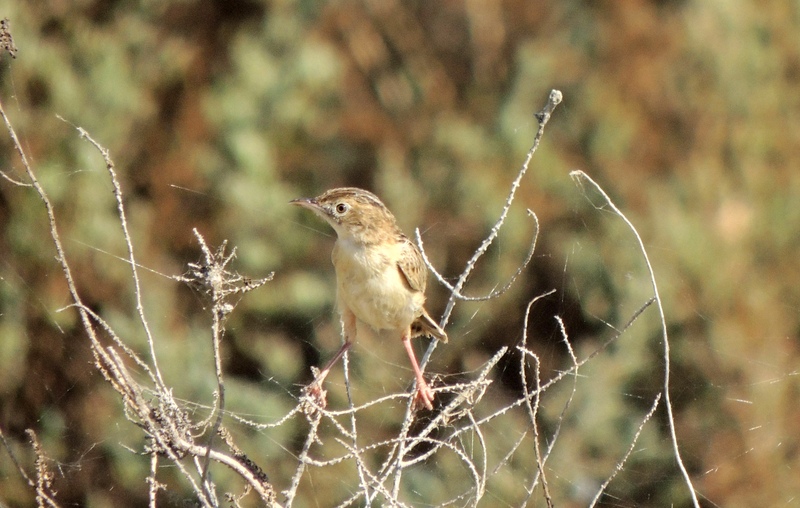 This Zitting Cisticola was one of a family party around the hide at Larnaca Sewage Works this morning. Also flying around the area were an adult and juvenile Little Tern and a Whiskered Tern which was still in breeding plumage. Categories: Birding | Tags: Cyprus Birding, Cyprus birds, Cyprus birdwatching, Larnaca birdwatching, Larnaca Sewage Works, Zitting Cisticola | Permalink.